As of August 2014, Reliablesoft.net is a proud Google Partner. You can verify our profile by visiting this link. 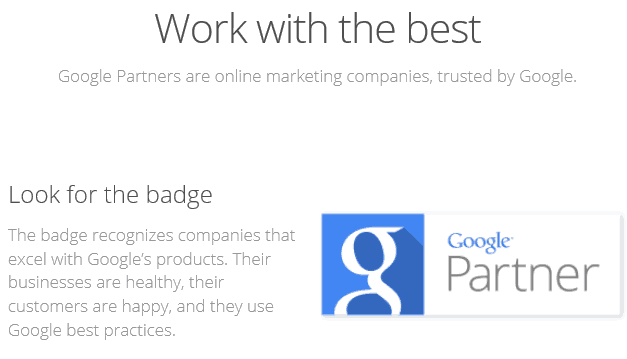 Google partners are companies that meet the criteria of the Google Partner program. The criteria for agencies include the use of Google best standards and practices, having employees that are certified to use Google products and managing client accounts with a minimum budget spend of 10K (for a 90 day period). As stated by Google in their Partners website, “Google Partners are online marketing companies trusted by Google”. For our existing clients this means that we will continue to work with you to meet your business goals and help you establish a profitable business online. For new clients this means that you are in good hands; we have the knowledge, experience and expertise to get your business where you want it to be and we will grow together. You can view our packages and contact us today to discuss your requirements and create a digital marketing plan tailored to your business needs.